若要了解您的 Azure 帳單，請比較您包含詳細每日使用量檔案的發票，與 Azure 入口網站中的成本管理報告。To understand your Azure bill, compare your invoice with the detailed daily usage file and the cost management reports in the Azure portal. 本文不適用於 Azure Enterprise 合約客戶 (EA 客戶)。This article doesn't apply to Azure customers with an Enterprise Agreement (EA customers). 如果您是 EA 客戶，請參閱了解 Azure Enterprise 合約客戶的帳單。If you're an EA customer, see Understand your bill for Azure customers with an Enterprise Agreement. 本文不適用於 Azure 的 Microsoft 客戶合約的客戶。This article doesn't apply to Azure customers with a Microsoft Customer Agreement. 如果您的帳單帳戶的 Microsoft 客戶合約時，請參閱了解您的 Microsoft 客戶合約發票上的 Azure 費用。If you have a billing account for a Microsoft Customer Agreement, see Understand the Azure charges on your Microsoft Customer Agreement invoice. 如需 Azure 雲端解決方案提供者 (Azure CSP) 計畫的計費方式說明 (包括計費週期、定價和使用量)，請參閱 Azure CSP 計費概觀。For an explanation of how billing works in the Azure Cloud Solution Provider (Azure CSP) program, including the billing cycle, pricing, and usage, see Azure CSP Billing Overview. 若您的發票上有一筆您想要了解詳細資訊的費用，您可以將使用量與成本和使用量檔案或 Azure 入口網站進行比較。If there's a charge on your invoice that you want more information about, you can compare usage and costs with the usage file or with the Azure portal. 詳細使用量 CSV 檔案會顯示依計費期間和每日使用量的費用。The detailed usage CSV file shows your charges by billing period and daily usage. 若要取得檔案，請參閱取得您的 Azure 帳單發票和每日使用量資料。To get the file, see Get your Azure billing invoice and daily usage data. 使用量費用會顯示在計量等級中。Your usage charges are displayed at the meter level. 下列字詞在發票和詳細使用量檔案代表相同意義。The following terms mean the same thing in both the invoice and the detailed usage file. 例如，發票上的計費週期與詳細使用量檔案中所顯示的計費期間相同。For example, the billing cycle on the invoice is the same as the billing period shown in the detailed usage file. 您發票的使用量費用區段會包含您計費期間所耗用的每個計量器總計值。The Usage Charges section of your invoice has the total value for each meter that was consumed during your billing period. 例如，下列螢幕擷取畫面顯示 Azure 排程器服務的使用量費用。For example, the following screenshot shows a usage charge for the Azure Scheduler service. 詳細使用量 CSV 的明細區段會顯示相同的費用。The Statement section of your detailed usage CSV shows the same charge. 「已使用」數量和「值」會與發票相符。Both the Consumed amount and Value match the invoice. 若要查看這筆費用的每日明細，請移至 CSV 的 [每日使用量] 區段。To see a daily breakdown of this charge, go to the Daily Usage section of the CSV. 篩選排程器下方計量類別。Filter for Scheduler under Meter Category. 您可以查看哪幾天有使用計量以及取用的量。You can see which days the meter was used and how much was consumed. 資源和資源群組資訊也會列出以供比較。The Resource and Resource group information is also listed for comparison. 「已使用」值加起來應該等於發票上所顯示的值。The Consumed values should add up to what's shown on the invoice. 若要取得每日成本，請將「已使用」數量乘上明細區段中的「費率」值。To get the cost per day, multiply the Consumed amounts with the Rate value from the Statement section. Azure 入口網站也可協助您確認費用。The Azure portal can also help you verify your charges. 若要取得您發票上使用量與費用的快速概觀，請檢視成本管理圖表。To get a quick overview of your invoiced usage and charges, view the cost management charts. 在 Azure 入口網站中，前往訂用帳戶。In the Azure portal, go to Subscriptions. 選取您的訂用帳戶 > [成本分析]。Select your subscription > Cost analysis. 依 [時間範圍] 篩選。Filter by Timespan. 繼續先前的範例，您會看到 Azure 排程器服務的使用費。To continue the previous example, you see a usage charge for the Azure Scheduler service. 選取該列來查看每日成本明細。Select that row to see the daily cost breakdown. 若要進一步了解，請參閱使用 Azure 計費與成本管理避免非預期的成本。To learn more, see Prevent unexpected costs with Azure billing and cost management. 外部服務 (或 Marketplace) 費用為協力廠商軟體廠商建立的資源費用。External services, or marketplace charges, are for resources that have been created by third-party software vendors. 您可以從 Azure Marketplace 取得並使用這些資源。Those resources are available for use from the Azure marketplace. 例如，Barracuda Firewall 是由協力廠商提供的 Azure Marketplace 資源。For example, a Barracuda Firewall is an Azure marketplace resource offered by a third-party. 適用於該防火牆和其相對應計量的所有費用都會顯示為外部服務費用。All charges for the firewall and its corresponding meters appear as external service charges. 外部服務費用會分開計費。External service charges are billed separately. 費用不會顯示在 Azure 發票上。The charges don't show up on your Azure invoice. 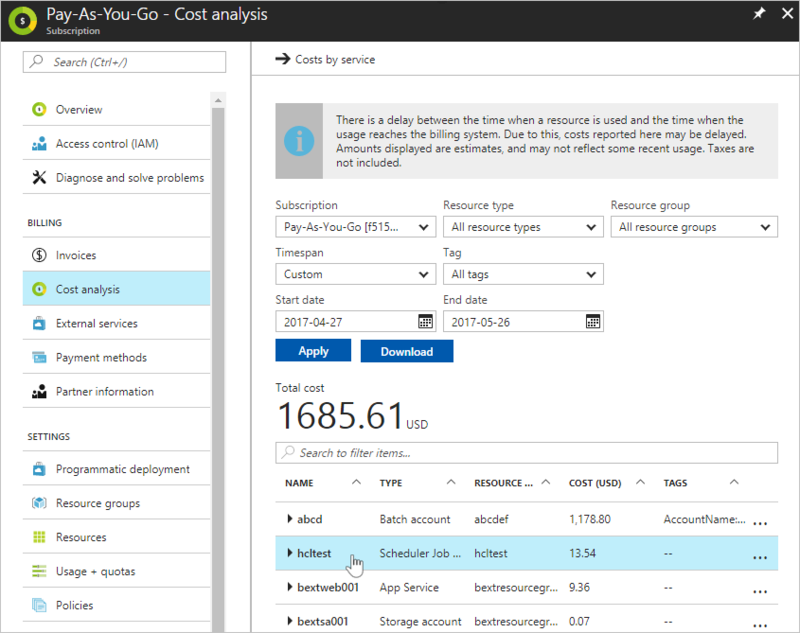 若要深入了解，請參閱了解您的 Azure 外部服務費用。To learn more, see Understand your Azure external service charges. Azure 不會直接根據資源成本計費。Azure doesn't directly bill based on the resource cost. 資源費用會使用一或多個計量來計算。Charges for a resource are calculated by using one or more meters. 計量用來追蹤其整個存留期資源使用量。Meters are used to track a resource’s usage throughout its lifetime. 接著，這些計量會用來計算帳單金額。These meters are then used to calculate the bill. 例如，當您建立單一 Azure 資源 (例如虛擬機器) 時，它便會建立一或多個計量執行個體。For example, when you create a single Azure resource, like a virtual machine, it has one or more meter instances created. 計量用來追蹤一段時間的資源使用量。Meters are used to track the usage of the resource over time. 每種計量都會發出使用量記錄，Azure 會使用這些記錄來計費。Each meter emits usage records that are used by Azure to calculate the bill. 建立 VM 時，每種計量會開始發出使用量記錄。When the VM is created, each meter begins emitting usage records. Azure 計量系統中會追蹤此使用量和計量的價格。This usage and the meter's price is tracked in the Azure metering system. 如果您設定信用卡或轉帳卡作為付款方式，我們會在計費期間結束後的 10 天內自動扣款。If you set up a credit card or a debit card as your payment method, the payment is charged automatically within 10 days after the billing period ends. 在您的信用卡對帳單上，明細項目的名稱會是 MSFT Azure。On your credit card statement, the line item would say MSFT Azure. 若要變更用來支付費用的信用卡或轉帳卡，請參閱新增、更新或移除 Azure 的信用卡或轉帳卡。To change the credit or debit card that's charged, see Add, update, or remove a credit or debit card for Azure. 如果您透過開立發票來付款，請將您的款項匯至發票底部所列的位置。If you pay by invoice, send your payment to the location listed at the bottom of your invoice. 若要檢查您的款項，狀態建立支援票證。To check the status of your payment, create a support ticket. 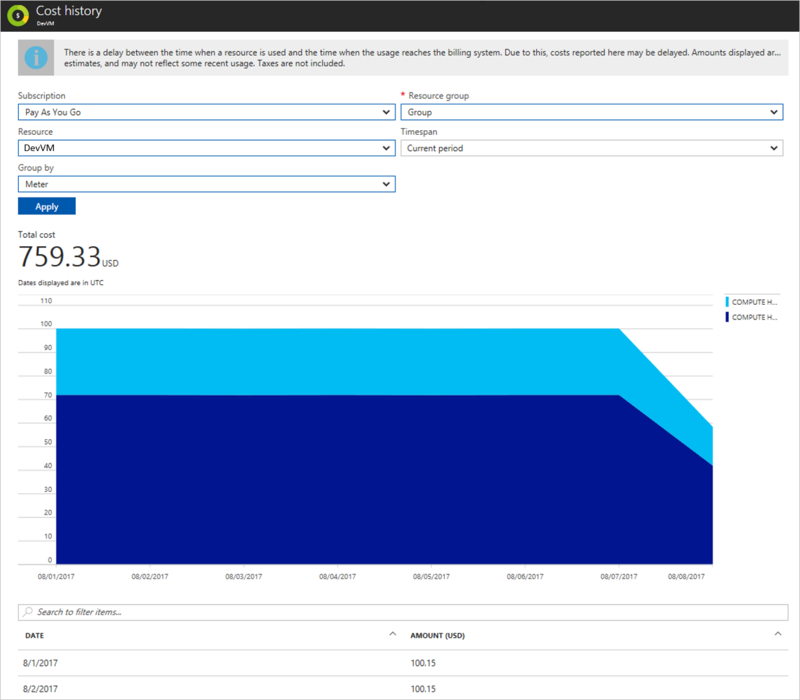 定期在 Azure 入口網站檢閱您的使用量和成本。Review your usage and costs regularly in the Azure portal. 如果您有任何疑問或需要協助，請建立支援要求。If you have questions or need help, create a support request.